Food Truck Website Design by UltraWeb Marketing. Do you have a new food truck idea or an existing Food Truck that needs a Food Truck Website Design? Let us help you take your culinary creations to the next level and get that extra exposure that your Food Truck desires and needs to be fruitful. Perhaps your Food Truck offers catering and has an event schedule. We can customize any aspect of your Food Truck Website Design no matter how complex or basic. Questions you should consider when you need a Food Truck Website Design. Do you have a menu for print and downloadable online? Do you need an event calendar to show where your Food Truck will be located. Do you want to process online payments? Do have a Blog for your new Food Truck Website Design? Does your new Food Truck Website Design have the proper Social Media Channels? If so, are they connected to your Food Truck Website Design. Facebook is great for announcing an in depth presence. Twitter is ideal for small bits of info like coupons and deals. YouTube is awesome for showing videos of length while Pinterest and Instagram are great for showing off pictures of your delicious offerings and delectable’s. 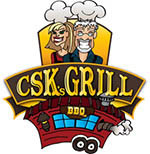 CSKs Grill is a Food Truck Website design that UltraWeb Marketing launched a few months ago. They are located in Colorado and offer Greeley Catering & their Food Truck services many locales in the surrounding Metro Denver area. Serving the best BBQ Greeley Co & Catering Greeley Co.
UltraWeb Marketing can handle all of your online marketing needs from Social Media to Search Engine Optimization. When starting a Food Truck business it is imperative to have an online appearance that is extraordinary. At UltraWeb Marketing we love food like you and designing beautiful websites with a excellent search engine visibility and a Social Media presence to match. Designing the perfect website design is similar to creating your Food Truck menu. Lot of moving parts and ingredients must be assembled in the proper order and format in order to be successful. We have the recipe for online success, call today to find out more about how we can help you take a new Food Truck concept or an existing one to the next level. Please visit our web design services page to learn more about UltraWeb Marketing and what we can do for your Food Truck Website Design.